closed December 10th-February 15th for hurricane repairs. Shaka Taco is Topsail Island's newest, freshest option. Chef Steve Christian and surf schooler Cody Leutgens transformed the iconic Mollie's building to create a one-of-a-kind establishment that the two Topsail High pals believe Surf City needed. The space, attached to Surf City City School, is designed for folks of any age to sit outside, relax, hang, play games, and maybe have a beer and/or delicious taco. Patrons order from a window and may dine on the patio, or carry their tasty treats to their destination of choice. The menu is comprised of ingredients sourced as locally as possible, including fish so fresh it has potential to swim from your tortilla. 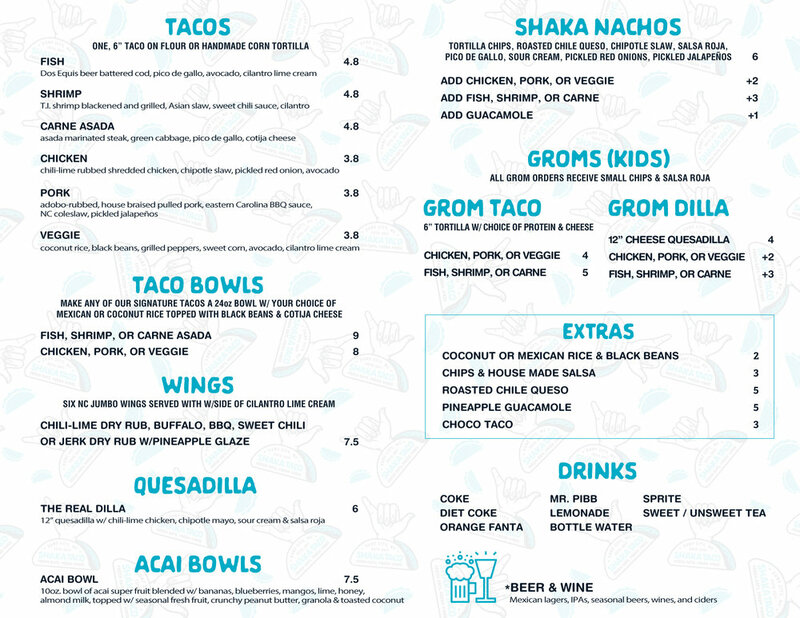 Christian and Leutgens designed a simplistic menu holding tacos, taco bowls, wings, and acai bowls. Each taco protein is paired with 3 toppings, all prepared multiple times daily - this allows for the respected protein to be complimented inside its tortilla home, rather than drowned out by filler or nonsense. Wings are NC jumbo flats and drums, lathered in homemade seasonings and sauces. Bowls are like a supersized taco over coconut or Mexican rice and seasoned black beans - order these gems with an appetite. And, well, if you've never had an acai bowl, let Shaka Taco spoil your tangy and sweet mystery. With hopes to satisfy the taste buds of patrons along the way, Christian and Leutgens strive to create simple, yet excellent lunch and supper eats. The two are attempting to tackle the untapped market of freshness through quality goods and palate pleasing, paired with an atmosphere encouraging positivity and good energy. This is Shaka Taco - Fresh Eats, Fresh Vibes.